The recently released black propaganda conducted against Catholicos-Patriarch of All Georgia Ilia II has united people of all ages, professions and social levels in condemnation. The video clips mocking Ilia II released by internet sites has become a main topic of conversation in many quarters and Orthodox groups, opposition parties, the President’s administration and the Georgian Orthodox Church have reacted strongly to them. “There are a lot of videos on my Facebook page about politicians and other famous people, so I do not see any problems with putting a video about the Patriarch there. In a time when such videos are being made about Presidents, politicians and even the Pope why it is a problem to make such a video about the Patriarch? I do not see any problems. The Patriarch is not a God!” Tutberidze told the weekly TV show Report of the Week, shown on Tbilisi-based Kavkasia TV on October 18. “If we claim to be building a democratic state, if we want freedom of speech in our country, then such video clips can be made about the Patriarch, politicians or other famous people,” she added. On October 7, during a meeting with Georgian teachers convened to discuss educational problems, the Catholicos-Patriarch said that the August war could have been avoided. “It [the August war] should not have happened and it was possible for it not to happen. We had the means of avoiding these problems,” Ilia II said. “When a ship is sailing on the sea, its pilot, the captain, should know where the icebergs are so as not to crash into them. We were facing, and are facing, a wall, but we are crashing into this wall with our heads” he added. Tutberidze says that these statements were “anti state”in her opinion and supportive of Russia. “This was really anti state, for me… I repeat once again that in my opinion Russia has persons it can rely on in Georgia, including some in the Patriarchate,” she noted. The Patriarchate released a special statement in response to these videos on Wednesday. “The campaign being carried out against the Patriarch and the Church aims to instill mistrust towards the Church. This is being done in order to abolish the basis of Georgia’s statehood and our fundamental values,” the statement reads. The Church called upon the faithful to strengthen their prayers and to keep calm, as people have been greatly disturbed by the videos and are demanding answers. The Patriarchate declared that involving spiritual leaders in discussions and polemics is part of a plot by enemy forces, who should be ignored. “The Catholicos-Patriarch of Georgia has rendered great service and makes a valuable contribution to our country and is fully supported and respected by the whole population, the President included. We will use all democratic political means to defend his reputation and not allow anyone to use the principles of freedom to act with evil intent,” the statement concludes. 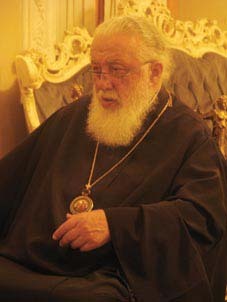 The head of Patriarchate TV Giorgi Andriadze thinks that the authorities are scared of the Patriarch’s influence and great authority among the people, as when the people do not believe in either the opposition or the Government the Patriarch and the Church are the institutions people trust the most. “This is not a personal assault on the Patriarch but an attack on all Orthodox people as the Patriarch is a leader of the Orthodox Church,” Andriadze says. The Christian Democrats, who respect Christian values and are striving to bring in constitutional amendments making Orthodox Christianity the official religion of Georgia, have strongly condemned the video tapes and urged the authorities to condemn the activities of Tea Tutberidze publicly. Speaking to The Messenger Zaza Gabunia, the Christian Democrats’ Director of Communications, said that this black propaganda against the Patriarch seeks to separate the Church, which has authoritative influence, from society. “What we are seeing is Bolshevik prejudices disguised as liberal and civil thinking. These attacks seek to isolate the Church and prevent it playing a public role, however these people really forget that Orthodox Church plays a significant role in our nation’s spiritual development, upholds our national values and helps form them in us,” he said. Gabunia added that the Catholicos Patriarch was talking about the wisdom the leader of a nation should have, whoever that may be, rather than making a directly political statement. However, he thinks that the root of the problem is the Patriarch’s high authority. “For Tutberidze and like minded people it is unacceptable that everyone in this country, no matter who they are, is ready to listen to the Patriarch and consider his advice. They think this is involvement in state affairs,” Gabunia said. “Whoever thinks that such immoral things as these videos should be allowed also should consider peoples’ reaction to them, as they could create a huge protest in the country,” he added. Leader of the Alliance for Georgia Irakli Alasania responded to the campaign by stating that the Patriarch’s authority could not be undermined by such things. “Everyone has seen the reaction to this and it is a perfect demonstration of what kind of authority our Patriarch has in the country,” Alasania said. The Conservative Party urged the Government to prevent the Liberty Institute from operating in Georgia. “The campaign of the Liberty Institute against the Georgian Apostolic Church and Patriarch of All Georgia Ilia II exceeds the all boundaries of ethics,” party leader Zviad Dzidziguri said. “We demand that the Liberty Institute be banned in the same way anti-semitic and fascist organisations are banned. The struggle against the Georgian Church and the Georgian Patriarch has gone beyond the limits. The dirty videos disseminated through the Internet insult the religious and patriotic feelings of hundreds of thousands of Georgian citizens,” Dzidziguri concluded. Vice-Speaker of Parliament and member of the ruling party Gigi Tsereteli stated yesterday that the Patriarch is dear to each person in Georgia. “The best assessment of the situation was that of the President’s administration, but the most important thing was the Patriarch’s appeal “be tolerant and keep calm.” “I do hope the people behind these videos will use their energy for more useful activities, however the principles of freedom cannot be used so indiscriminately,” Tsereteli added. Representatives of civil society have also demand that Tutberidze be punished. Yesterday, NGO and cultural organisation members discussed this topic, stating that if Tutberidze’s actions were not authorised by the authorities in the first place she should clearly be punished. Head of the NGO Former Political Prisoners for Human Rights Nana Kakabadze remarked that peaceful rallies demanding this will be started in the coming days by young people and students all over Georgia. Well-known film director Giga Lortkipanidze said that the authorities wanted no one else to have any influence in Georgia except themselves. “Tutberidze is a Government ally who wants to destroy the Church,” Lortkipanidze remarked. It is obvious from observing the reaction on internet forums that those who have seen these clips have been shocked. Hot debates are going on and most Georgians are strongly criticising and condemning the release of these videos. The Patriarch enjoys great respect in the Georgian population and outside the country and is the person Georgians trust and believe in more than any other.